WASHINGTON (AP)—Juan Martin del Potro won his 18th consecutive match and a spot in the Legg Mason Tennis Classic final with a 6-2, 6-1 victory over Tommy Haas on Saturday. Del Potro will play Viktor Troicki, who beat Igor Kunitsyn 6-4, 6-2 to earn his first career ATP finals berth. The second-seeded del Potro has won his last three tournaments. The winning streak is the second best on the ATP this year, behind Rafael Nadal’s 32 straight. Del Potro broke Haas for a 3-2 lead in the first set, starting a streak of eight games won. Haas finally held serve again to make it 4-1 in the second. Del Potro has only lost two sets during his 18-match run, which includes wins in Stuttgart, Germany, the Austrian Open and the Countrywide Classic in Los Angeles. His last loss came in the second round of Wimbledon on June 25. The Argentine is ranked No. 19 after starting the year at No. 50. “It seemed like I was a step slower, playing with his kind of power point after point,” Haas said. Troicki, ranked No. 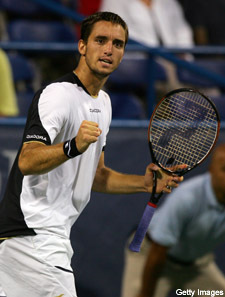 93, will have a tough task against del Potro, but he made getting to his first final look easy. Troicki put away Kunitsyn in 76 minutes, faster even than del Potro’s 82-minute victory. The win came a day after Troicki upset top-seeded Andy Roddick, who chose to play in the Tennis Classic rather than the Olympics in order to better prepare for the U.S. Open later this month. The match featured many lengthy rallies, with each player staying at the baseline trying to find an opening for the sharp groundstrokes. More often than not, it was Troicki who came out on top, drawing Kunitsyn into positions that opened up the court for Troicki’s 22 winners, or benefiting from one of Kunitsyn’s 21 unforced errors. Troicki broke Kunitsyn’s serve four times, and had one more break opportunity for match point leading 5-1. He wasn’t able to convert that one, but won the final game without losing a point. Troicki also held an edge with his serve, with seven aces—four of them game-winners—while Kunitsyn had none. Troicki’s final ace was a 131-mile-an-hour serve to end the match.